Established in Jeffreys Bay in 1998, Plancad Architecture & Interior Design offers professional turnkey architectural & design services, based on expertise gained from professional training and more than ten years’ experience locally and internationally. 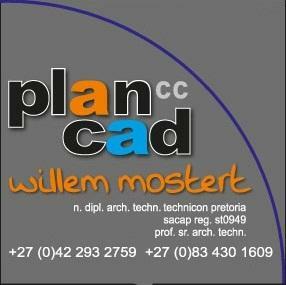 Being the sole member of the cc, the principal, Willem Mostert, with a national diploma in Architectural Technology from the Technicon of Pretoria, assures you of his personal and professional service from start to completion of your planning, building and / or décor project, and invites you to peruse his portfolio. Please feel free contact Willem on +27834301609 for all your architectural and design requirements, ranging from residential, corporate, industrial, hospitality, cluster development, etc, anywhere in the world. No project is too small or too large. Willem also offers town planning scheme departure application services.